Sonus faber is today part of brand portfolio of Fine Sounds Group, the holding company of the brands Audio Research, leader in the production and sales of audio electronic components High-Definition Vacuum-Tubes (valves) and Solid State, Wadia Digital, one of the first companies dedicated to high-performance digital audio playback, which has been at the forefront in technology for Apple iPod and iPhone docking stations, Sumiko, importer and distributor of the best audio components in North America. 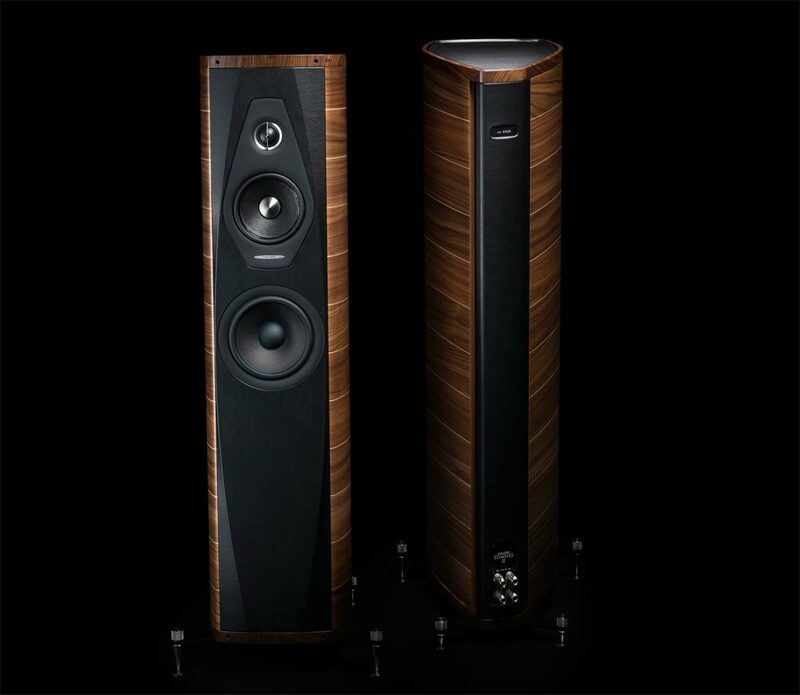 With these important acquisitions, result of the entrepreneurial project of Mauro Grange (CEO of Sonus faber and Fine Sounds Group), Sonus faber together with its American ‘sisters’ makes up the world’s largest group in the High-End sector, that is the sophisticated and prestigious world market of acoustic speakers and audio electronics. The recent acquisition of McIntosh, based in Binghamton – NY, is for End Sounds a “marquee investment” whose strategic objective is to offer products that are the best in the world in their category. The consolidated turnover of Fine Sounds Group, which employs 270 staff, amounts to $ 73 million per year. SYSTEM – 2 way standmount, paralaminar stealth flow vented loudspeaker. CABINET – Enhanced “Lyre shape” design, progressive thickness triple curvature cabinet walls damped spread resonance spectrum system. Solid walnut vertical clamps. TWEETER – Sonus faber “Arrow Point” DAD (Damped Apex Dome, synthesis of the classic dome and ring transducer) 29XTR2. A Sonus faber designed 29 mm moving coil driver. The ultra dynamic linearity is given by the new Neodymium motor system. MID-WOOFER – Sonus faber MW15XTR. 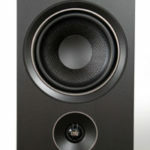 A totally Sonus faber designed150mmultradynamiclinearitymidwoofer. CCAW wire is used on a composite former “eddy current free” voice coil. The dynamically linear magnetic field motor incorporates triple Kellog/ Goeller rings. A special custom diaphragm is made with a real time air dried non pressed blend of traditional cellulose pulp, kapok, kenaf and other natural fibers, developed according to the most natural sound. To further inhibit any residual cone coloration we are using a transparent viscous surface damping coating. CROSS-OVER – Non-resonant “progressive slope” design, optimized amplitude/phase response for optimal space/time performance. “Paracross topology” on both tweeter hi-pass and midwoofer low pass, cross-over point 2.500 Hz. FREQUENCY RESPONSE – 50 Hz – 30.000 Hz, tuning port included. SENSITIVITY – 87 dB SPL (2.83 V/1m). NOMINAL IMPEDANCE – 4 ohm. 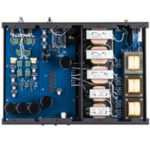 SUGGESTED AMPLIFIER POWER OUTPUT – 40W – 150W, without clipping. FINISHES – Natural walnut or graphite multicoated with medium gloss ecologically sensitive lacquer. DIMENSIONS – 354 x 222 x 368 mm (HxWxD). SYSTEM – 3 way floorstanding, paralaminar stealth flow vented loudspeaker. 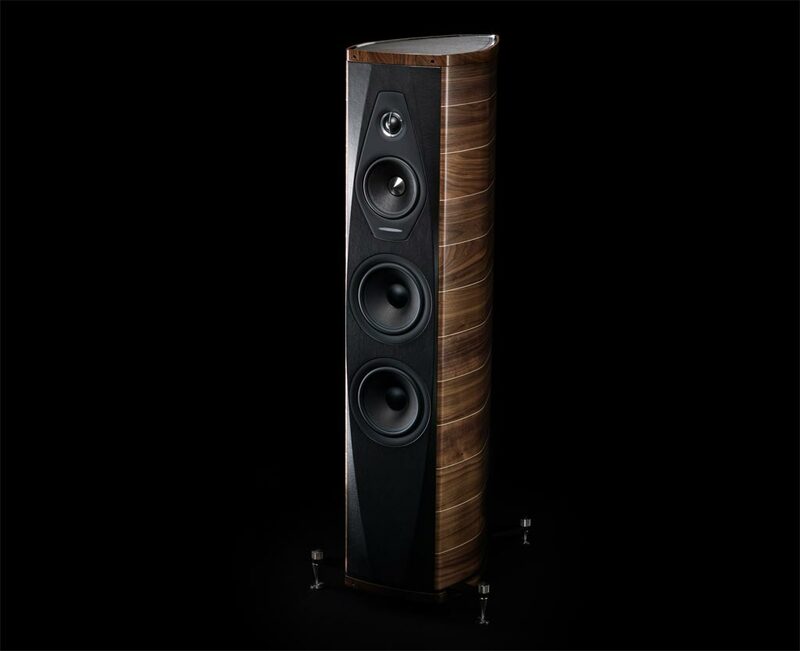 MIDRANGE – Sonus faber M15XTR. 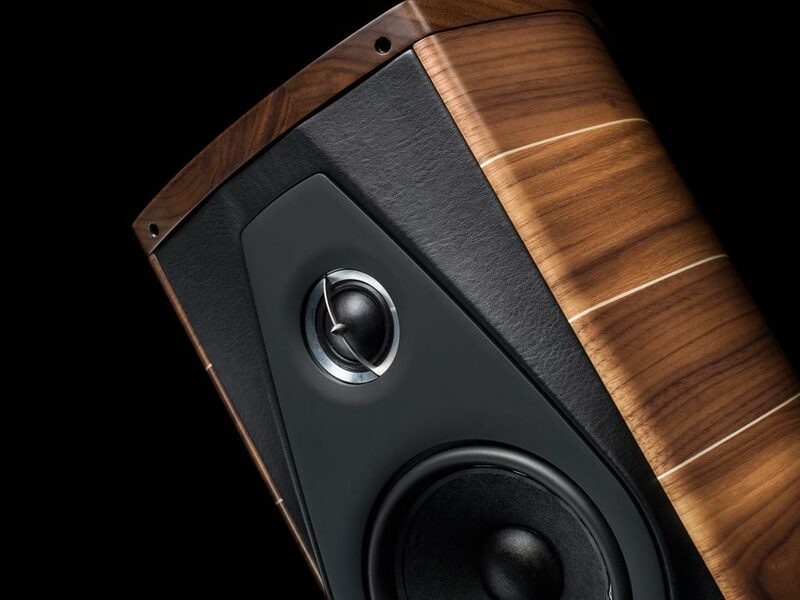 A totally Sonus faber designed150mmultradynamiclinearitymidwoofer. CCAW wire is used on a composite former “eddy current free” voice coil. The dynamically linear magnetic field motor incorporates triple Kellog/ Goeller rings. 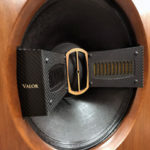 A special custom diaphragm is made with a real time air dried non pressed blend of traditional cellulose pulp, kapok, kenaf and other natural fibers, developed according to the most natural sound. To further inhibit any residual cone coloration we are using a transparent viscous surface damping coating. Special coaxial anti-compressors is used, designed to remove cavity resonance and distortions. in synergy with the sound of the midrange. This goal was reached by developing a “sandwich” membrane that combines a “heart” in hi-tech rigid syntactic foam with external layers in treated cellulose pulp. The 1.5” voice coils “controlled Eddy Current”, together with the powerful long stroke magnetic motor, are guarantees for excellent performance, both from the dynamic point of view and that of linearity. CROSS-OVER – Non-resonant “progressive slope” design, optimized amplitude/phase response for optimal space/time performance. “Paracross topology” on both tweeter hi-pass and midrange band pass, cross-over points 250 hz – 2.500 Hz. FREQUENCY RESPONSE – 40 Hz – 30.000 Hz, tuning port included. SENSITIVITY – 88 dB SPL (2.83 V/1m). SUGGESTED AMPLIFIER POWER OUTPUT – 50W – 250W, without clipping. FINISH – Natural walnut or graphite multicoated with medium gloss ecologically sensitive lacquer. midrange. This goal was reached by developing a “sandwich” membrane that combines a “heart” in hi-tech rigid syntactic foam with external layers in treated cellulose pulp. The 1.5” voice coils “controlled Eddy Current”, together with the powerful long stroke magnetic motor, are guarantees for excellent performance, both from the dynamic point of view and that of linearity. FREQUENCY RESPONSE – 35 Hz – 30.000 Hz, tuning port included. 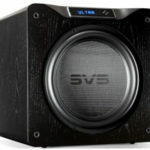 SENSITIVITY – 90 dB SPL (2.83 V/1m).